Protecting the frontend, headlights and grille of your truck is as much about peace of mind as it is style. 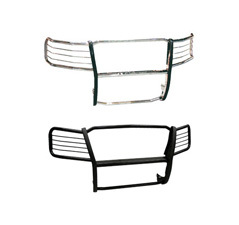 CSI Grille Guards are custom designed to perfectly fit the model-specific contours of your vehicle. The one-piece designs use 1 1/4" side plates and 1 1/2" tubing for a signature rugged appeal. To protect your expensive halogen, LED and HID lights, removable headlight guards fend off debris and hazards with ease. CSI's stainless steel grille guards are polished to a lustrous shine to ensure years of good looks or opt for the black powder-coated design for lasting durability and long life.